I haven't competed frequently in masters categories yet, being only 30, masters hasn't been an option. My cycling is (I hope) in its spring or summer, not Autumn, though that time will come. 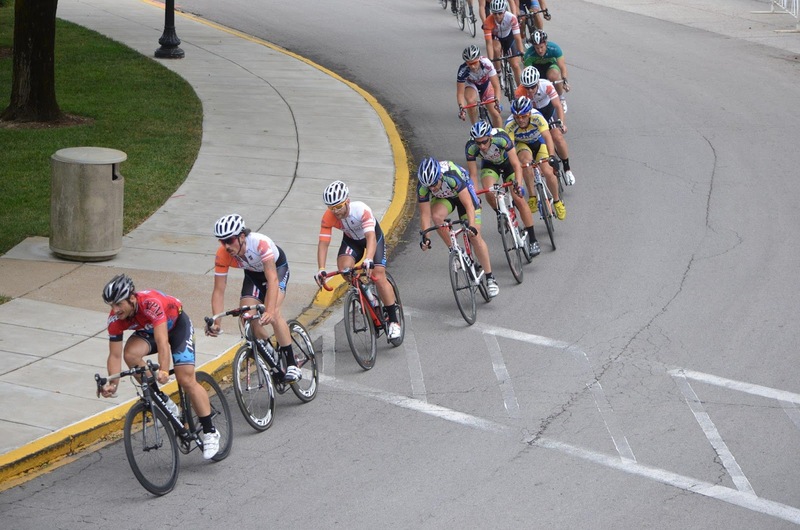 This weekend was a departure though as the main target was the MO State criterium championship's 30+ Cat 1-4 race. As a first year cat 2, my teammate BJ thought the 1/2 a more realistic goal for next year, so he set his sights on the 30+ prize. Checking the startlist, we did not have a large field, so we brought our own in the form of 8 Quantum Mesa Cycles racers. The boys worked together wonderfully. We are at about 85% on tactics. With 3 near podium sweeps this season, we are getting close. Considering how young in the sport we are, it's reason for pride. Well, we had the largest team by a factor of 4 I think, so we set about tiring rivals and keeping protected riders fresh. Photo credit: Kelly Croy Patty. Two of our riders who spent a lot of time off the front were Eric (5+ laps solo) and Chris ("fresh" off his state TT winning ride the day prior). But everyone worked, and worked well. I tried a move with Dr. Mark 20 min in but it didn't work. Unfortunately we were primed right after being caught. Ouch. With 8 laps to go the field was together save a trio just off the front. I attacked the pack and went overtop of them into turn 5 (if you count the big sweeper around the capitol as turn 4). Through the chicane I had a gap but no protected teammates on my wheel! (It turns out that BJ got pinched in turn 5.). So decision time, sprinter, write that match off and go back to the field or cruise and wait for fellow passengers to join the pain train. I chose the latter. And it made all the difference. After 2 laps solo (not a big deal to most, but it's me we're talking about here) and BJ is coming across with clean wheels. It's a happy and painful sight since its time to go to work. We drilled it for the next four laps, checking our 6 every corner and getting splits at the top of the course from other teammates. As the laps counted down I knew we had it. I was able to keep the speed up during my pulls and the gap was going out. We took the last lap a little easier and posted up the last 100 metres. A win is a special thing - even for the best they don't happen every day - but a state championship win is even sweeter. To celebrate over the line with a teammate, the gameplan executed to the letter? Magnifique. 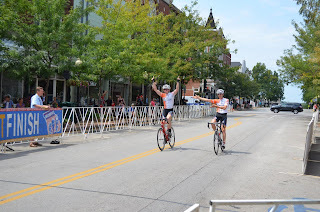 That is one of my happiest moments in cycling. B.J. and I crossing the line. And yes, in case you're wondering, I was scolded by the officials for removing my hands from the bars while we posted up. But what they didn't know until now is what my weekly training schedule looks like. This is super secret, so don't tell anyone! The lure of the state title along with the central location (StL v KC) brought a healthy field for the big boy race. I had a chat with Brad Huff (Jelly Belly pb Kenda) and picked his boy Austin (Mercy) for the win. BJ and I lined up for round two with no expectations - we accomplished what we came for, now we'll get some motorpacing in. And motorpacing it was! I suffered like a dog. Attacks went off the front quite frequently as GatewayHD, Dogfish, and Mercy threw down. I'm very glad I was in the race as it woke me up to the speeds I'll be seeing the next three weeks. Anyway, a field split happened. I tried and failed to go across, then the field came back together (no thanks to pack fodder like me!). With five to go I moved up but only enough to see the field sprint get polished off by Devin while I picked guys off to the line, finishing 13th (payout 10 deep). It was fun to race with the Western MO/KS set, catch a PRO tip from Huff, and get put in the box. After the race we all ate at this greasy pizza joint on the course. It's not often I eat a double bacon double sausage pizza, but I think I earned it. Now for another grueling week of training.